GPS: There are two turnoffs from the Trace into the campground, separated by about 200′. ACCESS: Paved roads to and within the campground. It’s narrow within the campground. There is one official handicap accessible site, but there may be other sites just as accessible. PULL THRU: Yes, most if not all. Note that the longer pull-thrus have two campsties. Wherever there is a picnic table there is a site. 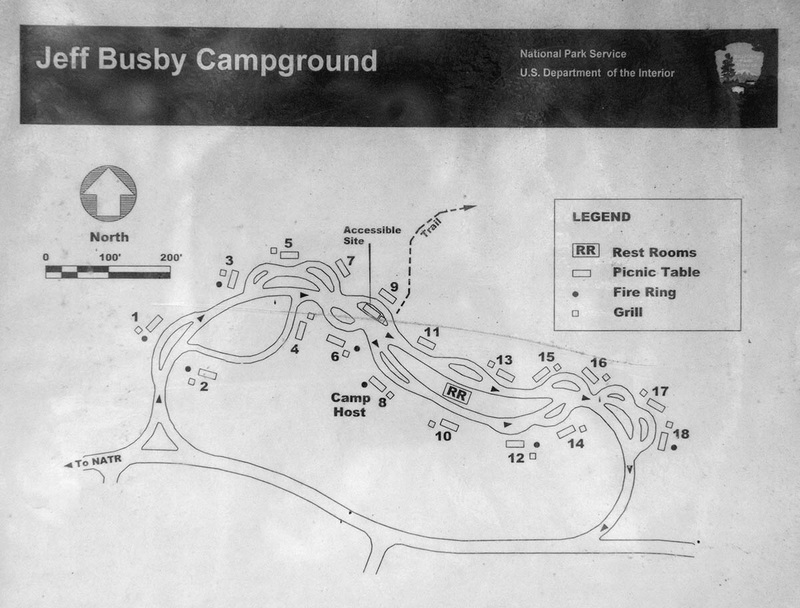 A map beside the restroom shows the campground layout. You may drive past some designated sites and not realize it so do consult the map. BACK-IN: I supposed you can back into a pull-thru, and at this location you may have to. MAXIMUM RIG SIZE: None stipulated. There were some very large Class As with towed vehicles and 5th wheels when I was there. FIRE GRILLS: Yes. Some waist high, others ground level. I didn’t check. As shown above the phone signal was rather weak but I was able to make calls without the booster so I didn’t set it up. Just a very short drive out of the campground and up the hill takes you to the top of Little Mountain. At 603′ elevation it’s one of the highest points in Mississippi! It is home to tiny Jeff Busby Park and worth a brief visit. On a nice day take a picnic lunch. BUGS: There wasn’t much bug activity when I was there in late March. There were a few big fat bumble bees, a couple mosquitos, and I saw quite a few butterflies. 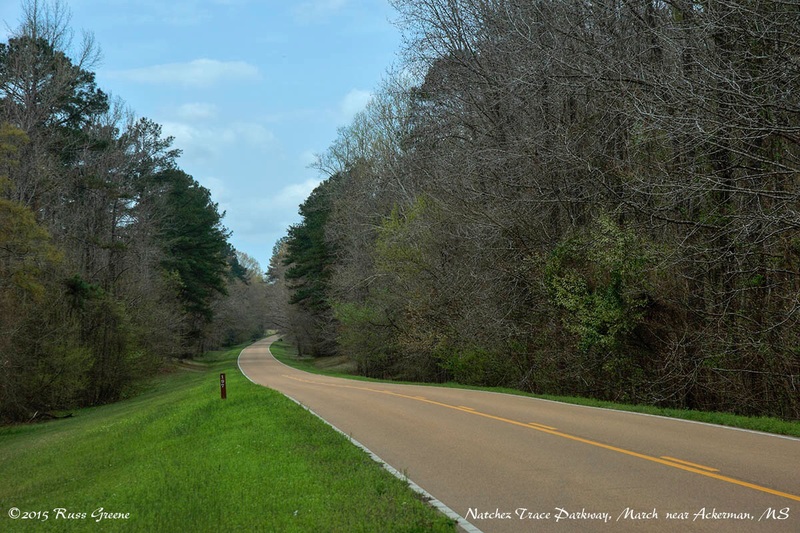 Natchez Trace Parkway in late March near Ackerman Mississippi. Dump: AllStays indicates it is Whites Creek Lake County Campground, in Eupora. I don’t know if you can dump there if you aren’t camped there. It’s about 12 miles north. Propane: AllStays indicates Starkville KOA Campground, Starkville. This is about 25 miles NE. Groceries: It looks like there are a couple markets north in Eupora: a Piggly Wiggly and a Supervalu. RV Parks: There are several Parks in the Starkville area to the west. The KOA mentioned above (see Propane) is one of them. 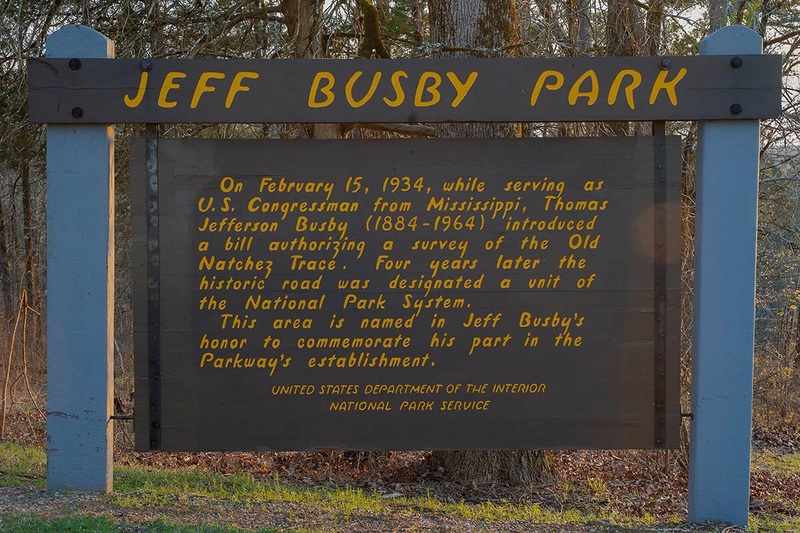 The campground was named after Jeff Busby, a former U.S. Congressman from MS. He introduced a bill which resulted in a survey of the Old Natchez Trace. Shortly after that, in 1938 it was designated as a National Park. The layout of the campground is somewhat unusual and a bit confusing in that pull-thrus may be host to more than one campsite. It’s can be difficult to tell which is the main campground road and which is a pull-thru. I think the best bet is to familiarize yourself with the campground map ahead of time. There is one provided online that has none of the campsite detail. There is one, however, on the campground bulletin board that shows all the sites by number. I photographed it and have included it with this report (see sidebar). The campground is set amidst towering pines and hardwood trees. 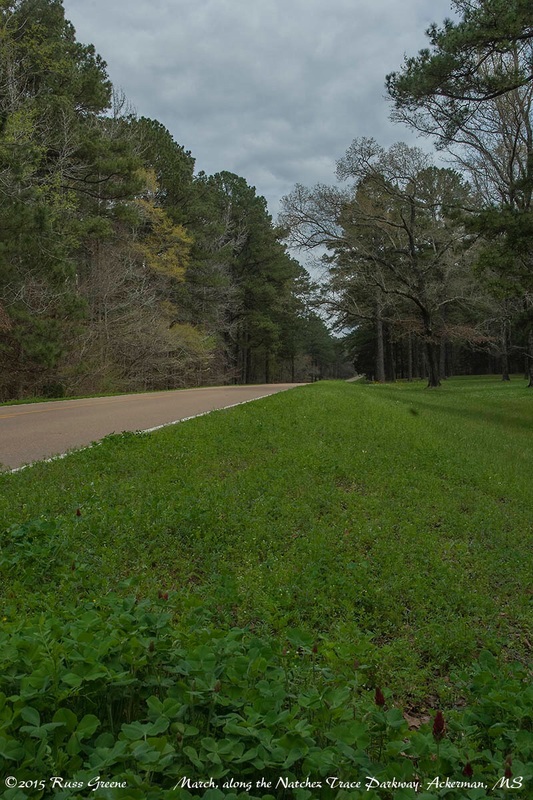 It was generally quiet when I was there despite its proximity to the Natchez Trace Parkway. The parkway didn’t have much traffic on it, possibly due to the season, early spring. Even so the campground was pretty much full by the end of the day. It’s small, with only 16 sites. Jeff Busby park which is separate from the campground is a very short drive up the hill and offers nice views. Alternatively, a hiking trail leaves the campground and runs through the woods to the park. It’s a little bit of a climb but a great alternative to driving. Allow 20-30 minutes for the hike one way. A large, manicured, grassy area would make a pleasant spot to picnic but note that there is no shade. 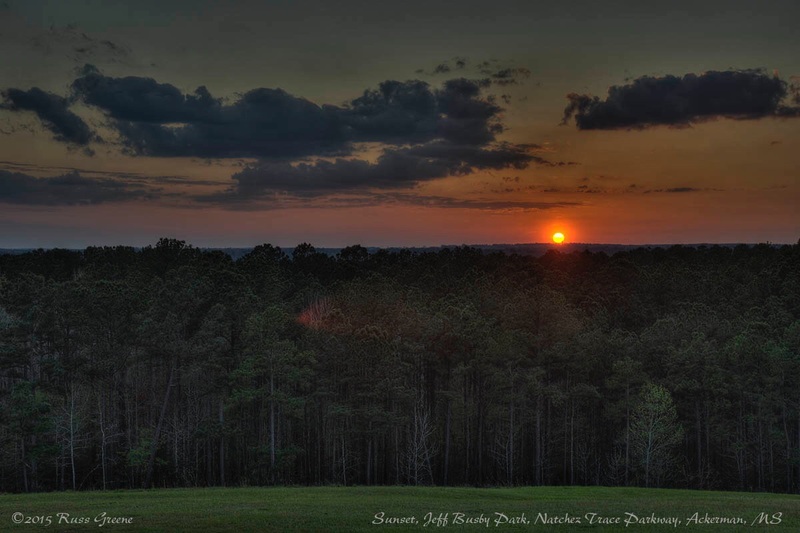 Today’s Natchez Trace (the Trace) is a National Park which is enough wider than the Natchez Trace Parkway itself to create a buffer giving you the feeling you are out in the wilderness driving through it. The average width of the park is 800′. The parkway is a narrow, shoulderless, two lane road that runs through the park approximating the original Trace. There is ample room for two big rigs to pass each other without much worry. It runs from Natchez, Mississippi, north and east to its northern terminus near Nashville, Tennessee. The 444 mile route passes through three states: Mississippi, Alabama, and Tennessee. The Great Smoky Mountain Parkway at 469 miles in length is a longer road than the 444 miles length of the Natchez Trace. However, it may be that the Natchez Trace National Park may be longer because the Great Smoky Mountain Parkway zigzags quite a bit. Such was the speculation of a park ranger at the Natchez Trace Visitor Center. The original route of the Trace follows a geologic ridge line used by prehistoric animals. Later, Native Americans used paths along the Trace created by bison, deer and other large game that could break paths through the dense undergrowth. Evidence of human civilization along the Trace dates back at least 2,000 years. The first record of a European explorer to travel the Trace dates to 1742. The route was later used as a trade route. Farmers, ranchers and merchants floated their wares down the Mississippi River to ports at Natchez and New Orleans, then sold or abandoned their rafts and boats since they couldn’t get them back upriver. The Trace was a route they used for the homeward journeys whether on foot or horseback. The Trace lost much of its usefulness with the advent of the steam powered riverboat that could more easily transport people and goods both upriver and down. Much of the drive along the Trace is like driving through the woods. It’s lovely. The shoulders are manicured grass, in places for 100′ or so to where the forest begins. The speed limit is 50. Commercial traffic is prohibited. I don’t recall seeing either a traffic light or a stop sign. There are no advertising billboards. If you want to get gas or stop at a restaruant, you jump off of the Trace into a nearby community hidden on the other side of the trees, so to speak. Small towns line the Trace, on the outside of the park. You don’t drive through them while driving the Trace. These things combine to make driving the Trace a most pleasant and peaceful journey. The NPS map of the Trace shows access to the original Trace a few miles north of Jeff Busby Campground. I was excited to walk part of that route and to think about all the history, all those who went before me so long ago. The route starts out promising, but unfortunately within a couple hundred yards it peters out to nothing one can follow. The park map shows the original route alongside the Trace but sadly where I attempted to follow it, well, it could not be done. In addition to the three RV/auto/tent campgrounds along the length of the Trace there are a number of bicycle-only campgrounds along the route. They are all free. 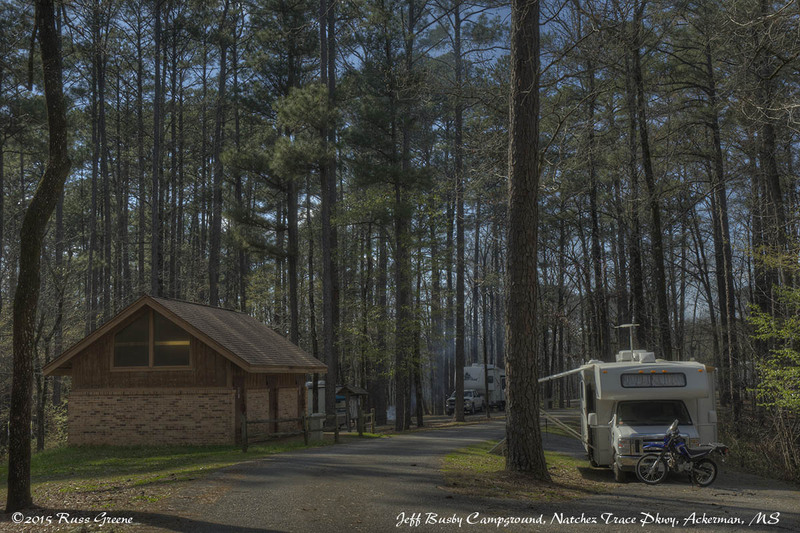 A quick tip for Jeff Busby Campground is that the parking area outside the campground alongside the Trace can be used as overflow camping when the campground is full. The pariking lot up the hill at Jeff Busby Park has been used as a secondary overflow when both the campground and lot alongside the Trace have filled. I’m not saying this in any official capacity, or course, but rather repeating what the campground host told me when I inquired. If you’re headed south on the Trace toward Natchez Rocky Springs, another free NPS campground is located at milepost 54.8. Closer to Natchez is Natchez State Park which I’ve stayed at before and which I’ve reported on here. If you are heading north another free NPS site on the Trace is Meriwether Lewis in the Hohenwald, TN area.